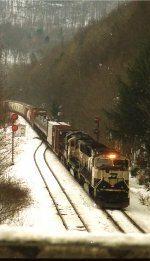 Description: 13T waits for a recrew at QD behind a pair of BNSF Grinstein green SD70s. They were not typically seen off coal trains, never mind on the east coast, so this was a treat. As usual, clouds ruled the day. Title: Whose railroad is this anyway?? Description: NS train 12T, running as CP 932, with UP power, meets NS 13T, running as CP 933, with BNSF power, at CPF 648 in Hop Bottom PA on CPs fomer DL&W main. Description: Coming around the wye! Looks like changes are coming to this busy junction. Description: BNSF Northbound Freight Train rumbles through Fordland, Mo. Description: BNSF 9728 West has been cooling its heels for over an hour and is finally pulling out of Ashburn on the "K-Line" after the passage of an eastbound. GEVO 5769 is aiding and 8855 is pushing as a DPU behind as the train continues its path towards a power plant further east. Title: BNSF 9728 leads a sks load of coal sb a scene from 1995. Description: While some of these units were just along for the ride, the lashup on the head end of this eastbound mixed freight that got stopped in Long Lake sure was eclectic, containing three "oldies but goodies." Description: Newly repainted and upgraded to an SD70MACe. Description: Recently rebuilt SD70MAC is a DPU on an empty train as a loaded UP train approaches.